5-Spacecraft, Mission Design, Mission Operations 2016 Bauer, B., et al., 2016. Lessons Learned from the New Horizons July 4th Anomaly. AIAA SpaceOps 2016. 5-Spacecraft, Mission Design, Mission Operations 2010 Bowman, A., 2010. Spacecraft Hibernation: Concept vs. Reality, A Mission Operations Manager's Perspective. AIAA. 5-Spacecraft, Mission Design, Mission Operations 2004 Bowman, A., Chacos, A. A., DeBoy, C. C., Furrow, R. M., Whittenburg, K. E., 2004. New Horizons Mission to Pluto/Charon: Reducting Costs of a Long-Duration Mission., 55th International Astronautical Congress, Vacouver, Canada. 5-Spacecraft, Mission Design, Mission Operations 2016 Bucior, S. E., Sepan, B., Jones, D., 2016. New Horizons and the Pluto flyby: A flight control team's story. IEEE, Aerospace Conference. 5-Spacecraft, Mission Design, Mission Operations 2007 Bushman, S. S., 2007. In-Space Performance of the New Horizons Propulsion System. AIAA. 5-Spacecraft, Mission Design, Mission Operations 2007 Chang, Y., Lear, M. H., McGrath, B. E., Heyler, G. A., Takashima, N., Owings, W. D., 2007. New Horizons Launch Contingency Effort. In: El-Genik, M. S., (Ed. ), Space Technology and Applications International Forum-STAIF 2007, Vol. 880, pp. 590-596. 5-Spacecraft, Mission Design, Mission Operations 2008 Cheng, A. F., et al., 2008. Long-Range Reconnaissance Imager on New Horizons. Space Science Reviews 140, 189-215. 5-Spacecraft, Mission Design, Mission Operations 2010 Flanigan, et al., S. H., 2010. Destination Pluto: Performance During the Approach Phase. IAF, 66th International Congress. 5-Spacecraft, Mission Design, Mission Operations 2008 Fountain, G. H., et al., 2008. The New Horizons Spacecraft. Space Science Reviews 140, 23-47. 5-Spacecraft, Mission Design, Mission Operations 2008 Guo, Y., Farquhar, R. W., 2008. New Horizons Mission Design. Space Science Reviews 140, 49-74. 5-Spacecraft, Mission Design, Mission Operations 2008 Hamilton, S., Hart, H. M., 2008. Operational Pre-Planning For Intensive Science Periods" The New Horizons Jupiter Flyby. AIAA Space 2008 Conference and Expostion, San Diego, CA. 5-Spacecraft, Mission Design, Mission Operations 2016 Harch, A., et al., 2016. Accommodating Navigation Uncertainties in the Pluto Encounter Sequence Design. AIAA, SpaceOps 2016. 5-Spacecraft, Mission Design, Mission Operations 2007 Harmon, B. A., Bohne, W. A., 2007. A Look Back at Assembly and Test of the New Horizons Radioisotope Power System. In: El-Genik, M. S., (Ed. ), Space Technology and Applications International Forum-STAIF 2007, Vol. 880, pp. 339-346. 5-Spacecraft, Mission Design, Mission Operations 2006 Hersman, C. B., et al., 2006. Optimization of the New Horizons Spacecraft Power Demand for a Single Radioisotope Thermoelectric Generator. 57th International Astrounautical Congress, Vol. IAC-06-C3.4.05, Valencia, Spain. 5-Spacecraft, Mission Design, Mission Operations 2008 Hor�nyi, M., et al., 2008. The Student Dust Counter on the New Horizons Mission. Space Science Reviews 140, 387-402. 5-Spacecraft, Mission Design, Mission Operations 2015 Jensen, J. R., Weaver, G. L., 2015. Frequency Performance of the New Horizons Ultra-stable Oscillators: Nine years of Continuous In-flight Monitoring. IEEE, International Frequency Control Symposium, Denver, CO.
5-Spacecraft, Mission Design, Mission Operations 2010 Kusnierkiewicz, D., Fountain, G., 2010. New Horizons: A Space Mission of Extreme. INCOSE Insight Article 13, 8-10. 5-Spacecraft, Mission Design, Mission Operations 2008 Kusnierkiewicz, D., et al., 2008. 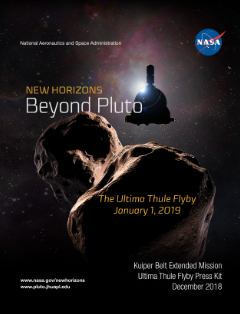 The New Horizons Mission to the Pluto System and the Kuiper Belt: Mission Overview, Engineering Challenges, and Current Status. IEEE Big Sky. 5-Spacecraft, Mission Design, Mission Operations 2006 Kusnierkiewicz, D. Y., et al., 2006. System Engineering Challendges on the New Horizons Project. 57th International Astronautical Congress, Valencia, Spain, pp. IAC-06-D1.5.03. 5-Spacecraft, Mission Design, Mission Operations 2005 Kusnierkiewicz, D. Y., Hersman, C. B., Guo, Y., Kubota, S., McDevitt, J., 2005. A description of the Pluto-bound New Horizons spacecraft. Acta Astronautica 57, 135-144. 5-Spacecraft, Mission Design, Mission Operations 2007 Lear, M., McGrath, B., Takashima, N., Heyler, G., 2007. JHU/APL Breakup Analysis Tool (APLbat) for the New Horizons Radiological Contingency. In: El-Genik, M. S., (Ed. ), Space Technology and Applications International Forum-STAIF 2007, Vol. 880, pp. 571-578. 5-Spacecraft, Mission Design, Mission Operations 2008 McComas, D., et al., 2008. The Solar Wind Around Pluto (SWAP) Instrument Aboard New Horizons. Space Science Reviews 140, 261-313. 5-Spacecraft, Mission Design, Mission Operations 2007 McGrath, B. E., Frostbutter, D. A., Chang, Y., 2007. Probabilities of Ground Impact Conditions of the New Horizons Spacecraft and RTG for Near Launch Pad Accidents. In: El-Genik, M. S., (Ed. ), Space Technology and Applications International Forum-STAIF 2007, Vol. 880, pp. 579-589. 5-Spacecraft, Mission Design, Mission Operations 2008 McNutt, R. L., et al., 2008. The Pluto Energetic Particle Spectrometer Science Investigation (PEPSSI) on the New Horizons Mission. Space Science Reviews 140, 315-385. 5-Spacecraft, Mission Design, Mission Operations 2008 Reuter, D. C., et al., 2008. Ralph: A Visible/Infrared Imager for the New Horizons Pluto/Kuiper Belt Mission. Space Science Reviews 140, 129-154. 5-Spacecraft, Mission Design, Mission Operations 2016 Rogers, G., et al., 2016. New Horizons Guidance & Control and Propulsion Systems Budgets vs Performance for the Pluto Encounter. AAS, Breckenridge Guidance & Control Conference. 5-Spacecraft, Mission Design, Mission Operations 2016 Rogers, G., Flanigan, Kirk, 2016. New Horizons Trajectory Correction Maneuver Flight Implementation and Performance. AAS, Breckenridge Guidance & Control Conference. 5-Spacecraft, Mission Design, Mission Operations 2010 Rogers, G., Flanigan, S., 2010. Effects of Radioisotope Thermoelectric Generator on Dynamics of the New Horizons Spacecraft. AAS, Breckenridge Guidance & Control Conference. 5-Spacecraft, Mission Design, Mission Operations 2016 Sepan, R., et al., 2016. Preparing and Executing the New Horizons Uplink Occulation: Applying concepts, tools and lessons learned over nearly a decade of flight to execute a successful operation., AIAA, SpaceOps 2016. 5-Spacecraft, Mission Design, Mission Operations 2016 Stanbridge, D. R., et al., 2016. New Horizons Pluto Encounter Maneuver Planning and Analysis. Astronautical Sciences Spaceflight Mechanics 158. 5-Spacecraft, Mission Design, Mission Operations 2008 Stern, S. A., 2008. The New Horizons Pluto Kuiper Belt Mission: An Overview with Historical Context. Space Science Reviews 140, 3-21. 5-Spacecraft, Mission Design, Mission Operations 2008 Stern, S. A., et al., 2008. ALICE: The Ultraviolet Imaging Spectrograph Aboard the New Horizons Pluto-Kuiper Belt Mission. Space Science Reviews 140, 155-187. 5-Spacecraft, Mission Design, Mission Operations 2008 Tyler, G. L., et al., 2008. The New Horizons Radio Science Experiment (REX). Space Science Reviews 140, 217-259. 5-Spacecraft, Mission Design, Mission Operations 2008 Weaver, H. A., Gibson, W. C., Tapley, M. B., Young, L. A., Stern, S. A., 2008. Overview of the New Horizons Science Payload. Space Science Reviews 140, 75-91. 5-Spacecraft, Mission Design, Mission Operations 2008 Young, L. A., et al., 2008. New Horizons: Anticipated Scientific Investigations at the Pluto System. Space Science Reviews 140, 93-127. 1-Mission Science (Post-Pluto Encounter) 2017 Cook, J. C., et al., 2017. The distribution of water, methanol, and hydrocarbon-ices on Pluto: Analysis of New Horizons spectral images. Icarus Submitted. 1-Mission Science (Post-Pluto Encounter) 2017 Olkin, C. B., Ennico, K., Spencer, J. R., 2017. The Pluto System, a Review. Nature Astronomy Under Review. 1-Mission Science (Post-Pluto Encounter) 2017 Zangari, A., et. al., 2017. Have stellar occultations probed Charon's chasmata? Icarus Submitted. 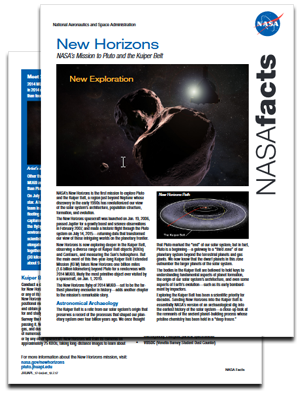 1-Mission Science (Post-Pluto Encounter) 2016 Bagenal, F., et al., 2016. NASA's New Horizons mission to Pluto. COSPAR Space Research Today 195, 9-20. 5-Spacecraft, Mission Design, Mission Operations 2005 By Stern et al., ALICE: The Ultraviolet Imaging Spectrograph Aboard the New Horizons Pluto Mission Spacecraft, Society of Photo-Optical Instrumentation Engineers,Proceedings of SPIE, Volume 5906, 2005. 5-Spacecraft, Mission Design, Mission Operations 2005 Slater et al., Radiometric Performance Results of the New Horizons' ALICE UV Imaging Spectrograph, Society of Photo-Optical Instrumentation Engineers,Proceedings of SPIE, Volume 5906, 2005. 5-Spacecraft, Mission Design, Mission Operations 2005 DeBolt et al., A Regenerative Pseudonoise Range Tracking System for the New Horizons Spacecraft, ION-Institute of Navigation 61st Annual Conference, Cambridge, MA, June 2005, pp. 487-497. 5-Spacecraft, Mission Design, Mission Operations 2005 Morgan et al., Calibration of the New Horizons Long-Range Reconnaissance Imager, Society of Photo-Optical Instrumentation Engineers,Proceedings of SPIE, Volume 5906, 2005. 5-Spacecraft, Mission Design, Mission Operations 2005 Conard et al., Design and Fabrication of the New Horizons Long-Range Reconnaissance Imager, Society of Photo-Optical Instrumentation Engineers,Proceedings of SPIE, Volume 5906, 2005. 5-Spacecraft, Mission Design, Mission Operations 2006 C. B. Haskins et al., Flexible Coherent Digital Transceiver for Low Power Space Missions, 2006 IEEE Aerospace Conference Proceedings, pp. 1-8. 5-Spacecraft, Mission Design, Mission Operations 2002 Guo, Yanping, Farquhar, Robert W., New Horizons Mission Design for the Pluto-Kuiper Belt Mission, AIAA/AAS Astrodynamics Specialist Conference, Monterey, CA, August 5-8, 2002, AIAA-2002-4722. 5-Spacecraft, Mission Design, Mission Operations 2004 Miller et al., New Horizons Pluto Approach Navigation, From Advances in the Astronautical Sciences, vol. 119, no. I, Space Flight Mechanics 2004, 2005, pp. 529-540, AAS/AIAA Space Flight Mechanics Meeting, Maui, HI, Feb. 8-12, 2004. 5-Spacecraft, Mission Design, Mission Operations 2006 Ottman, Geffrey K., Hersman, Christopher B., The Pluto-New Horizons RTG and Power System Early Mission Performance, 4th International Energy Conversion Engineering Conference and Exhibit (IECEC), San Diego, CA, June 26-29, 2006, AIAA 2006-4029. 5-Spacecraft, Mission Design, Mission Operations 2004 DeBoy et al., The RF Telecommunications System for the New Horizons Mission to Pluto, 2004 IEEE Aerospace Conference Proceedings, vol. 3, pp. 1463-1476. 5-Spacecraft, Mission Design, Mission Operations 2004 Haskins C. B., Millard, W. P., X-band Digital Receiver for the New Horizons Spacecraft, 2004 IEEE Aerospace Conference Proceedings, vol. 3, pp. 1488+. 2-Mission Science (Pre-Pluto Encounter) 2015 Nimmo F. and Spencer J.R., 2015. Powering Triton's recent geological activity by obliquity tides: Implications for Pluto geology. Icarus, 246, 2-10. 4-Publications inspired by or relevant to New Horizons (Pre- and Post-Pluto Encounter) 2015 Malamud U., Prialnik D. Modeling Kuiper belt objects Charon, Orcus and Salacia by means of a new equation of state for porous icy bodies, Icarus, 246, pp. 21-36, 2015. 1-Mission Science (Post-Pluto Encounter) 2017 Linscott, I. R., 2017. Radio Brightness Temperature Measurements of Pluto at 4.2 cm with New Horizons. Submitted. 1-Mission Science (Post-Pluto Encounter) 2016 Schenk, P. M., Nimmo, F., 2016. New Horizons at Pluto. Nature Geosciences Commentary 9, 411-412. 5-Spacecraft, Mission Design, Mission Operations 2010 Ebert, R. W., McComas, D. J., Rodriguez, B., Valek, P., Weidner, S., 2010. A Composition Analysis Tool for the Solar Wind Around Pluto (SWAP) Instrument on New Horizons. Space Science Reviews 156, 1-12. 1-Mission Science (Post-Pluto Encounter) 2017 Singer, K. N., et al., 2017. Impact craters on Pluto and Charon reveal a deficit of small Kuiper belt objects. Science submitted. 1-Mission Science (Post-Pluto Encounter) 2017 Olkin, C. B., Grundy, W., 2017. A Survey of Pluto's Surface Composition. In: Badescu, V., Zacny, K., (Eds. ), Outer Solar System. Prospective Energy and Material Resources. Springer-Verlag. Submitted Chapter. 6-Additional Articles of Special Interest to New Horizons 2011 Archinal, B. A., et al., 2011. Report of the IAU Working Group on Cartographic Coordinates and Rotational Elements: 2009. Celestial Mechanics and Dynamical Astronomy 109, 101-135. 6-Additional Articles of Special Interest to New Horizons 2009 Archinal, B. A., et al., 2011. Erratum to: Reports of the IAU Working Group on Cartographic Coordinates and Rotational Elements: 2006 & 2009. Celestial Mechanics and Dynamical Astronomy 110, 401-403. 2-Mission Science (Pre-Pluto Encounter) 2015 Earle, A. M., Binzel, R. P., 2015. Pluto's insolation history: Latitudinal variations and effects on atmospheric pressure. Icarus 250, 405-412. 2-Mission Science (Pre-Pluto Encounter) 2015 McKinnon, W. B., 2015. Introduction to 'Pluto, Charon, and the Kuiper belt objects': Pluto on the eve of the New Horizons encounter. In: Spohn, T., Schubert, G., (Eds. ), Treatise on Geophysics. Elsevier. 2-Mission Science (Pre-Pluto Encounter) 2011 Showalter, M. R., Hamilton, D. P., Stern, S. A., Weaver, H. A., Steffl, A. J., Young, L. A., 2011. New Satellite of (134340) Pluto: S/2011 (134340) 1. International Astronomical Union Circular 9221, 1. 2-Mission Science (Pre-Pluto Encounter) 2012 Showalter, M. R., et al., 2012. New Satellite of (134340) Pluto: S/2012 (134340) 1. International Astronomical Union Circular 9253, 1. 2-Mission Science (Pre-Pluto Encounter) 2006 Weaver, H. A., et al., 2006. Discovery of two new satellites of Pluto. Nature 439, 943-945. 5-Spacecraft, Mission Design, Mission Operations 2015 Hamilton, S., Hart, H. M., Bowman, A., Rogers, G., 2015. New Horizons Hibernation Operations: It Takes a Lot of Work to Sleep. IEEE, Aerospace Conference. 5-Spacecraft, Mission Design, Mission Operations 2016 Hamilton, S., Hart, H. M., Whittenburg, K., 2016. A Mission Planner's Perspective: Planning, Development, and Verification of the New Horizons Pluto Flyby Command Sequences. AIAA, SpaceOps 2016. 1-Mission Science (Post-Pluto Encounter) 2017 Steffl, A. J., 2017. Pluto's Ultraviolet Spectrum, Detection of Airglow Emissions, and Surface Reflectance. The Astronomical Journal Pending submission. 1-Mission Science (Post-Pluto Encounter) 2018 Verbiscer, A. J., 2017. Phase Curves of Nix and Hydra from the New Horizons Imaging Cameras. The Astrophysical Journal Letters, accepted. 1-Mission Science (Post-Pluto Encounter) 2018 Olkin, C. B., Grundy, W., 2018. A Survey of Pluto�s Surface Composition. In: Badescu, V., Zacny, K., (Eds. ), Outer Solar System: Prospective Energy and Material Resources. Springer, Cham, pp. 3-13. 5-Spacecraft, Mission Design, Mission Operations 2017 Guo, Y., 2017. New Horizons Extended Mission Design to the Kuiper Belt Object 2014 MU69, 27th AAS/AIAA Space Flight Mechanics Meeting. 5-Spacecraft, Mission Design, Mission Operations 2011 Guo, Y., 2011. Halfway Flight Performance of the New Horizons Mission, 9th IAA Low Cost Planetary Missions Conference. 5-Spacecraft, Mission Design, Mission Operations 2008 Guo, Y., 2008. Flight of the New Horizons Spacecraft to Pluto and the Kuiper Belt, IAF, 59th International Astronautical Congress. is the average distance between Earth and the Sun, about 93 million miles or 149 million kilometers. is gas that has escaped from a comet (or Pluto) and become ionized by ultraviolet sunlight. is the amount of mass per unit volume of matter, and is usually given as grams per cubic centimeter or kilograms per cubic meter. Water at room temperature has a density of 1 g/cm3 (or 1000 kg/m3), rocks are about 3 g/cm3, and iron has a density of 7.9 g/cm3. For convenience, you can say "Pluto has a density of about 2," meaning it is about twice as dense as water. occurs when a dense material (such as rock) sinks into the middle of a planet and leaves a lighter material (such as ice) on the outer layer. Differentiation generally requires that the interior of the object become warm enough to melt and allow materials to separate—a bit like chocolate chips moving to the bottom of a tub of melting ice cream. is the departure of an elliptical orbit from a circle. A circle has an eccentricity of 0; a very elongated orbit has an eccentricity approaching 1. The eccentricity of Pluto's orbit has the largest value of all the planets (0.248). is the plane of the Earth's orbit. Most of the planetary orbits are close to this plane. Pluto's orbit is inclined at an angle of 17.14 degrees to the ecliptic plane—the largest deviation of any planet. occurs when a minority constituent condenses out from an atmosphere, such as water on freezing out of the Earth's atmosphere or (probably) methane on Pluto. For both Earth and Pluto, the main constituent is molecular nitrogen (N2). When the atmosphere itself condenses, as in N2 on Pluto, it forms ice, not frost. The difference is significant, both from the surface (very different surface textures result from the two processes) and from the atmosphere, where frost formation is limited by the ability of the minority species to move through the majority component, while condensation of ice is only limited by the ability of the atmosphere to cool. is the part of the electromagnetic spectrum next to visible light. Wavelengths of infrared light are longer than those of visible light. is the region in a planet's upper atmosphere where sunlight ionizes gases. have orbits that are strongly influenced by Jupiter's gravity and usually take less than 20 years to make a single trip around the Sun. is a disk of thousands of icy objects (known as Kuiper Belt objects [KBOs]) outside Neptune's orbit, about 30–50 astronomical units (au) from the Sun. is the region where a planet's magnetic field or ionosphere shields the planet from the solar wind. occurs when an object moves behind another object. In a stellar occultation, for example, a star moves behind a planetary object. Most comets come from the Oort Cloud, a roughly spherical-shaped region between 10,000 and 100,000 astronomical units (au) from the Sun, and typically have orbital periods of about a million years. is when sunlight stimulates a chemical reaction, such as changing methane into more complex hydrocarbon molecules. combines separate images covering neighboring or nearby regions into a single image. are newly charged particles in the outer regions of an atmosphere; once they become ionized, they are usually "picked up" and carried away in the solar wind. is the onboard computer's Programmable Read-Only Memory. was the object that later became Triton, before it was captured by the planet Neptune. occurs when energetic particles (such as those from the Sun or cosmic rays from beyond the solar system) bombard a planetary object and break up molecules in the top layers of the surface. When the molecules rejoin, they often form larger molecules. Thus, under the influence of radiolysis, the simplest hydrocarbon, such as methane, can be turned into complex organic materials. —the fraction of light that is reflected, rather than absorbed—is an important property of a planet's surface. Reflectivity factors into surface temperatures; high reflectivity (such as white) means little absorption of sunlight and a cooler surface, similar to the advantages of wearing white clothes in summer. Conversely, a very dark surface absorbs lots of sunlight and warms up. is the bending of light due to a gradient in density, such as the bending of light around the limb of a planet's atmosphere. There are many forms of Resonance between planetary objects, but the simplest is when one object orbits the Sun (or a satellite orbits a planet) in exact proportion to another object's orbit. For example, Pluto orbits the Sun twice for every three times Neptune orbits, putting them in a 2:3 resonance. Most of the objects in the solar system spin and orbit the Sun in the same direction —counterclockwise looking down on the solar system from above. Retrograde objects have suffered collisions that caused them to spin or orbit in the opposite direction. is the streams of charged particles that speed from the Sun into space. is the study of light coming from an object by examining the intensity at different wavelengths—and a very powerful tool for investigating the composition of surfaces and atmospheres. is the transformation of a solid into a gas. You see it on Earth with theatrical fog machines. are also known as the "rocky" planets; they include Mercury, Venus, Earth, and Mars.